A smart leisure time planner. People plan to enrich leisure time but don’t know what to do. It’s time-consuming to search websites that may not have interested or completed information, read unstructured articles, check social media. LOCAL solves the problem by organizing and recommending personalized information and helps plan entertainment life in a few clicks. Users plan their spare time by conducting research over internet from travel websites, social medias or event organizer sites. If they are lack of time or bored gathering information, they may choose to join friends’ plan or give up going out. Customers, which are business owners paying us like private exhibition organizers, choose current media and website to promote themselves. Examples of competitors are TripAdvisor, Facebook event, Yelp, Eventbrite and NYC.com. 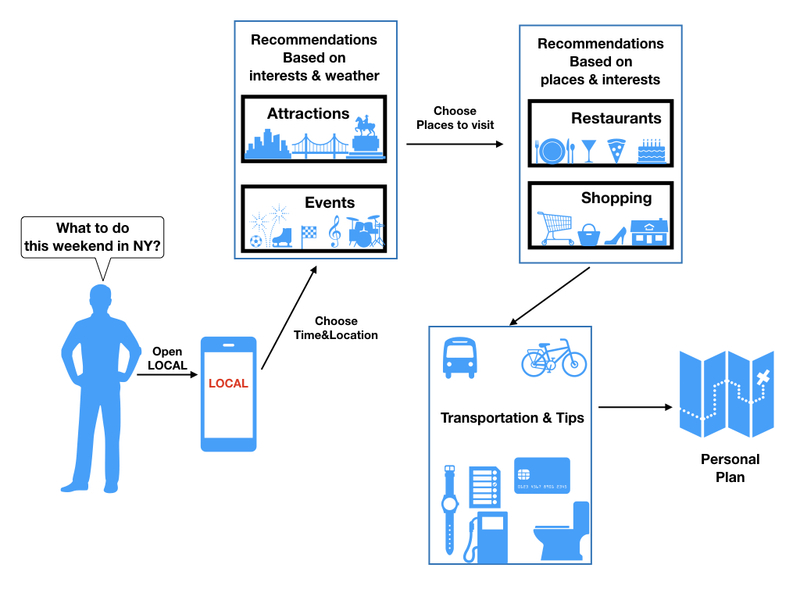 LOCAL consolidates information about events, attractions, restaurants in one app, provides personalized recommendations and works as a user-friendly planner. LOCAL promotes activities with a concise interface and users generate plans in a few clicks. As for business owner side, LOCAL promotes information efficiently by directly push information to target consumers. LOCAL’s customers are different from users, which are small business owners who try to promote their business and would pay on subscription base. We charge event promoters, restaurant owners, travel agency, private exhibitions or other beneficiaries in LOCAL’s network on a monthly subscription premium package. LOCAL saves their marketing expense and generates additional customer traffic for their business.